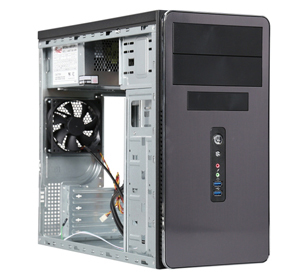 The Rosewill R521-M Mini Tower Computer Case is a stylish, durable, rich-featured Mini Tower with great affordability. It comes packed with all essential features, like excellent expandability, effective cooling performance, a reliable power supply etc., letting you easily build your own rig. 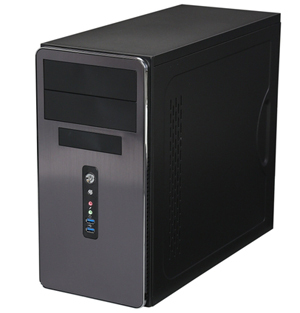 Though small in size, the Rosewill R521-M Mini Tower Case offers ample interior room to accommodate your PC components, like a Micro-ATX or Mini-ITX motherboard, a long graphics card etc. It also offers up to five internal 3.5” drive bays, two external 5.25” drive bays, and one 3.5” external drive bays, as well as four expansion slots for great expandability. Keep your system running cool. 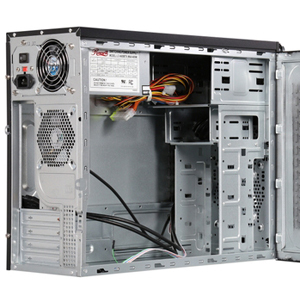 The Rosewill R521-M is preinstalled one 90 mm fan at rear panel. 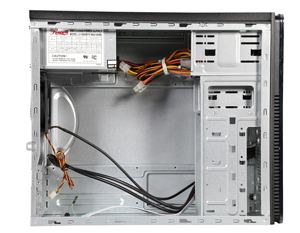 One fan slot on the front panel allows you to install one additional 120 mm or 80 mm fan. The included 400W switching power supply offers pure, stable power to all your components with amazing power efficiency. The clever fan design allows for little or no detectable fan noise during regular operation. 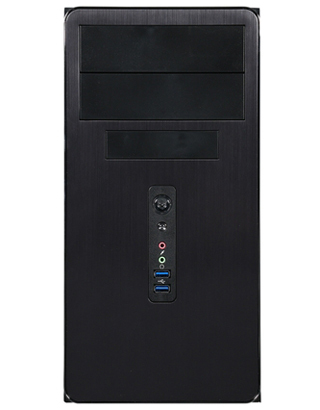 The Rosewill R521-M is constructed of premium steel material for long-lasting durability. The stylish aluminum-look front panel gives it an attractive look while giving you an easy, quick access to two SuperSpeed USB 3.0 ports and two audio jacks. 14.25" x 7.00" x 17.20"
Pros: The 2 USB 3.0 on the front panel is a nice touch. Included power supply is good, and works well for a PC that isn't power hungry. I've had this case+psu for over a year and I am only now upgrading PSU as I upgraded my GPU from a GTX 1050 and want a more efficient psu. Tons of room to install an optical drive, ssd, or hdd. Even with the small 90mm exhaust fan,and no other fans, the case doesn't get hot under load. Great case, that has help up well in my house, even with two kids under 5 jumping, rolling, and kicking around the place. Cons: The interior finish doesn't match the exterior. The case could use a front intake fan to compliment the rear exhaust fan. When you decide to add an intake fan, the front of the case doesn't provide the best airflow. Other Thoughts: I would recommend, and purchase this product again. It has a very classic, straight forward look for a home or business. Pros: Basic case with included power supply. Was actually surprised how quiet the fans were. Other reviewers stated that the power supply was junk and fan was loud. The cpu fan was louder than the power supply fan and the rear case fan. Case has a nice classy look and USB 3.0 on front panel. Would buy this case again for a simple build. Cons: Power LED was inoperative but was not going to send the case back just for that. I had several old cases and removed one of the LED's out one of them and fitted it into this case. Would think that a new case with USB 3.0 on the front panel would have a SSD mounting spot. Knocked one egg for inoperative LED and no SSD mounting spot. The guts were transfered from another case to this one. A very convenient build for mee, ... that is cost effective. Cons: This frame is a little to flexible and came bent. I straightened it so all 4 legs will touch a flat surface. The power switch is just to bright.......! Removed it from the pwr swtch header pins and placed it over the hdd activity pins. This workied out ok, I have an activity light and can see/tell the power is on. Other Thoughts: My Re-build : I had this board in a Rosewill Line-M case originallly. Transffered it all into this case so I could send it as a gift. This cleared up all inconsistencees and gave me the original box w/newer parts! Cons: It's Cheap. 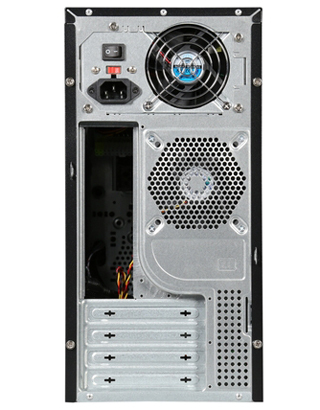 Case felt pretty flimsy, sharp edges can be dangerous, included case fan is very noisy. Other Thoughts: I would only recommend buying this if you are on a tight budget. Other Thoughts: For the people complaining about no USB 2.0, buy a motherboard that has USB 3.0. They cost the same as any other motherboard. If, for some odd reason, you want a USB 2.0, but the Prudent Way PWI-INT-CR07 All in One Internal Card Reader, which not only has USB 2.0, but SD, MicroSD, MMC, etc. For the people complaining about Motherboard space, again you are wrong. You probably installed the motherboard improperly because I have now owned two of these and never once had a problem with any micro-ATX board, or any other board for that matter. If this case came without the PSU, it would be probably around $20-25. I would recommend making a version without the PSU for the people who have a power supply already and just need a case. I'm not saying the built-in one is bad, becuase it isn't, it is very good. I would recommend getting this case if you need a decent PSU and case to save a buck or two for a CPU/GPU or even RAM. Pros: I liked the 2 USB 3.0 ports, and the PSU works well! Still working fine after more than a year! Cons: Cheap flimsy construction, I like the DIYPC much better. It has thicker metal, and doesn't feel like I'm going to break it. Other Thoughts: PSU is good, and quiet, but the construction feels cheap. Go with the DIYPC. Cons: -No USB 2.0 connector so if your mobo doesn't have 3.0 then it's worthless. We are really sorry to hear that and do understand your frustration; You could contact our support team with the product invoice to claim your warranty if the case is still within 1-year warranty. Thank you for your time. 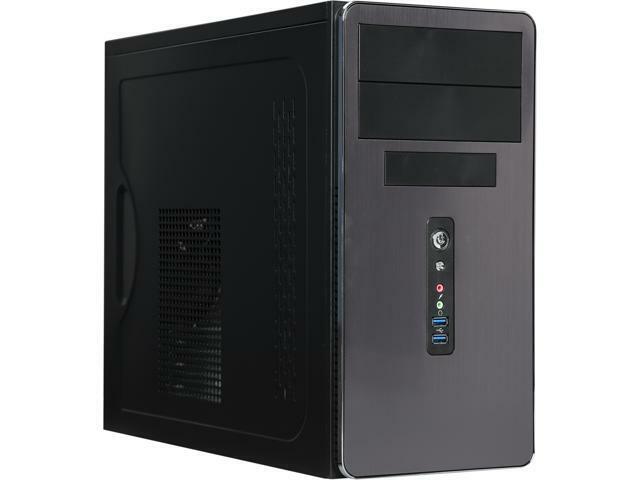 Pros: I'm sorry to say that i cannot think of anything positive about this computer case except that it is cheaper than the one I used to buy the 363 which used to be the same price. Cons: Where do i begin? It has no front USB 2.0 connectors, only 3.0, so if your motherboard doesn't have 3.0 connectors ...... It's really cheaply made. The space for the back panel is too large, therefore, I had to use some tape to hold it in place. Sorry. They had a great case in the 363. Why they discontinued it is beyond me. Other Thoughts: I would not recommend this product. I've purchased thousands of cases and this one is way on the bottom of the list of ones I would buy. Sorry Rosewill. You blew it on this one. We greatly appreciate your purchase. We apologize for any problems this product has caused and for your dissatisfaction with our product. We strive to provide the best quality and service to you. Rest assured that your feedback will receive the attention it deserves. Thank you.